Last night I had a hunkering for gluten free peanut butter cookies. I went over to Elise’s site, Simply Recipes, and found a yummy looking recipe for gluten-filled Peanut Butter Cookies. I experimented a bit, made a couple of changes to her recipe and came up with a nice gluten free cookie dough. 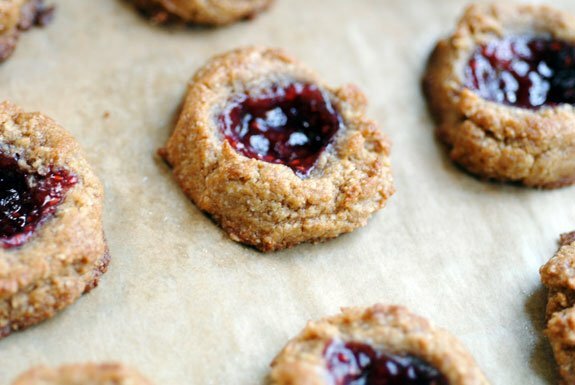 I then decided that it might be fun to make a gluten free peanut butter and jelly cookie. So here you have it, high protein, gluten free peanut butter and jelly cookies, the product of my insomnia and late night experimentation. When I pulled these out of the oven, I was thinking about breakfast the next morning. What else is there to think about than the next meal? And I thought to myself, these cookies are healthy enough for a quick, on the go bite, maybe even breakfast. They have a good amount of protein and fiber (from the almond flour and peanut butter) and still a bit more protein from the egg. That all turned out to be in theory, though, because this morning I had a peanut butter protein shake. Yes, I am on a peanut butter kick, as you can see. If you do not want to use peanut butter, you could try experimenting with sunbutter or creamy roasted almond butter. In terms of finding a replacement for the egg in this recipe, I’m not sure what would work. If you have a good solution, please leave a comment below. Generally, I use Fiori di Fruta jams, however, my boys have been on a sugar kick lately and so in this recipe I used Cascadian Farms jam which is organic and sweetened with sugar rather than juice. Made these last night as I was looking for a gluten free thumbprint cookie and happened upon your website. They turned out great, I didn’t have palm shortening so substituted butter and it worked fine. YUMMY! Hi Elana, you are amazing and great inspiration! :) I made this cookies just i the morning and they are great! I used homemade strawberry-pineapple-banana jam. Thank you! Made this cookie justy last night. Delicious! I used very little jam, but that is personal preference. Really Yummy :). Nom Nom – Thanks Elana! What an easy and lovely cookie! I used coconut oil instead of shortening and evaporated cane sugar instead of coconut sugar. It’s what I had on hand. I’ll keep these in the cookie rotation! made these today as a special treat – and they DISAPPEARED from the plate in minutes flat. THANKS for sharing! I made these peanutbutter snd jelly cookies for a baby shower and everyone eat all of them. Thank you!!!!! They have a powdered egg replacer at most health food stores such as the Granary or Whole Foods. In case it’s helpful for others, I’d like to share my substitutions. Using what I had on hand, I made a double batch and was quite pleased with the results. I made these a bit larger in size – using a small ice cream style scoop for more uniform results, and made 32, 2.5″d cookies. With the larger size they required about 12 minutes of baking time. Lastly, I used a silicone baking mat in lieu of a parchment liner. Thank you, Elana, for all the great recipes!